Hair accessories have become a big trend once again, with a focus being on statement designs - from sparkles, bold colours to gemstones. We show you how easy it is to make your own hair accessories using gemstones and beads! 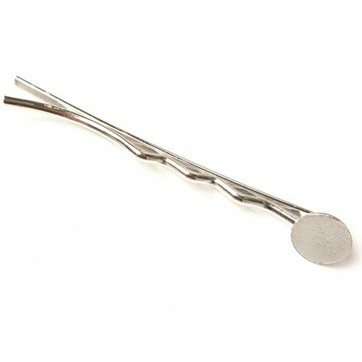 Our silver plated hair grips are only £2 for a pack of 10, making them great for experimenting with designs using your favourite gemstones. 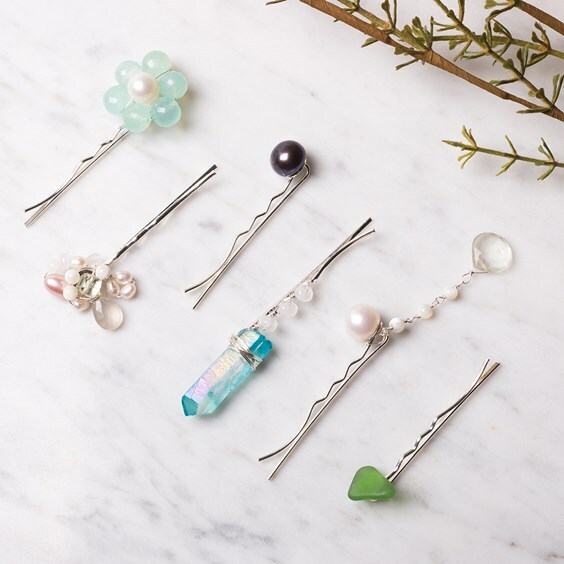 These hair grips are perfect for DIY gifts for friends, we also show you some wonderful bridal inspired designs, which would be lovely for a bride to wear on her wedding day or as gifts for her bridesmaids. We hope this post gives you some ideas and inspiration for creating fun designs! Share yours on social media and make sure to tag us in your designs and use the hashtag #Kernowcraft for a chance to feature. Gift bags - for presenting your item if you're giving it as a gift! 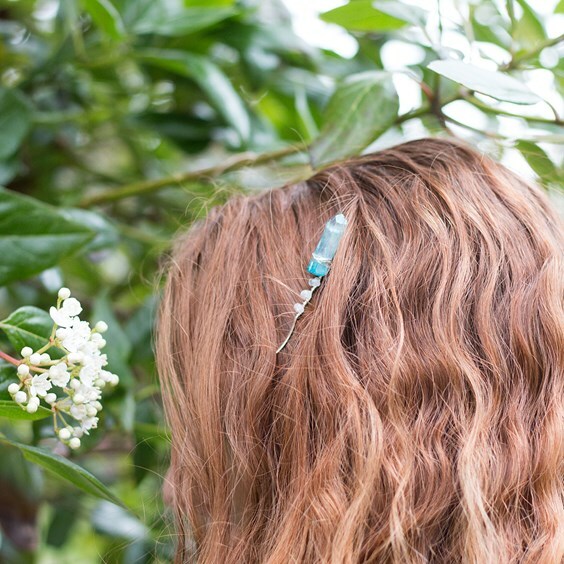 Our pack of 10 hair grips are great for creating quick and easy designs, perfect for gifts for family and friends - or a treat for yourself! They have a 7mm flat plate, ready for you to flue a gemstone onto for an instant design - although you can use larger stones too. We always recommend Devcon Epoxy Glue for jewellery making as it offers high-quality bonds and secure settings so your design will last. Crystals are a brilliant way to add that boho look to your designs. 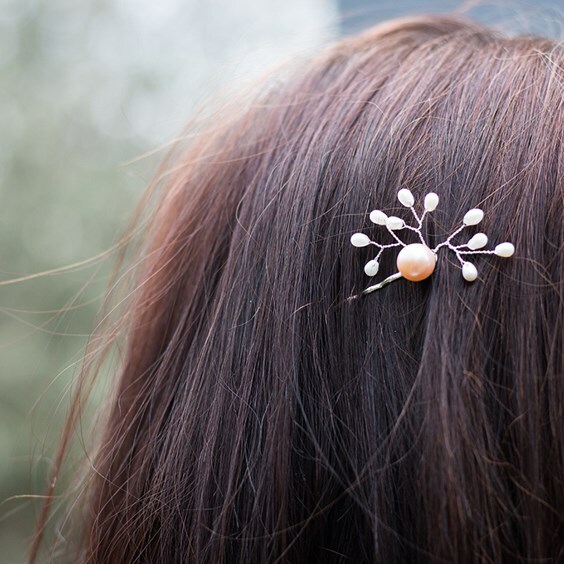 Here we have wire-wrapped a mystic crystal point onto the hair grip and combined the design with mother of pearl beads for a design perfect for a festival. If you're a beginner, you may like to read our wire-wrapping tutorials here. This simple and classy design is perfect for a wedding. We've combined a blush pink pearl with rice pearls to add texture. Browse our range of pearl gemstones here. TIP: If you would like to use a pearl bead to glue onto the hair grip, use half drilled beads so you can glue it down on the hole side. Put Your Sea Glass To Good Use! Everybody loves sea glass, and no doubt you have a stash somewhere just waiting to be used. 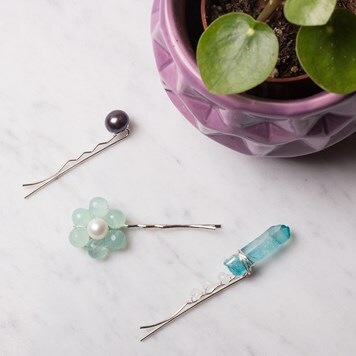 These hair accessories couldn't be easier to make. 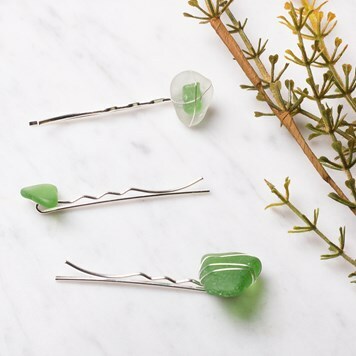 You can either choose to glue the stone to the flat plate of the hair grip or wire wrap the sea glass over the hair grip and secure in place. Perfect for spring! 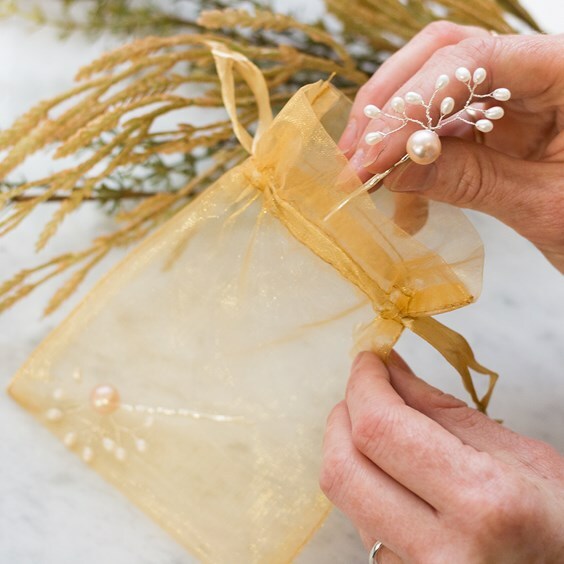 We especially love the wire-wrapped chalcedony and pearl flower design. Simply thread wire through the beads and secure it to the hair grip by wrapping the excess wire around it. 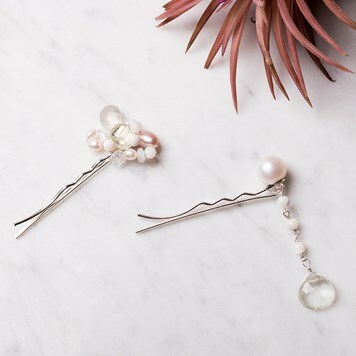 Great for a bride and her bridesmaids, these cluster pearl hair grips are so pretty. A simple wire wrap featuring your favourite gemstone beads is a quick and easy way to create a statement design. Or why not create a dangling hair grip, by wire wrapping a briolette bead. Read our tutorial on how to create a bead chain here. 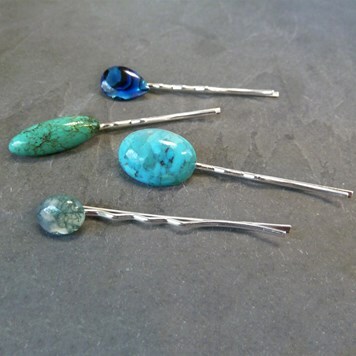 Our hair grips are suitable to use with cabochons measuring 7mm or larger. Cabochons are perfect for gluing onto flat plates! Choose from our large range of gemstone cabochons and use Devcon epoxy glue to secure onto the hair grip flat plate for an instant design. 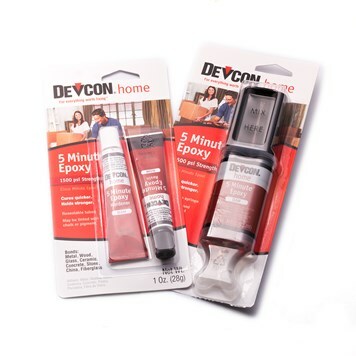 Devcon Epoxy 5 Minute Glue is our recommended glue for jewellery making. It's reliable, fast drying, high strength, sets clear and is perfect for setting stones onto mounts or settings. It's also great for bonding metal, glass, ceramic, concrete and wood so a favourite among crafters. Available as a syringe or tube, and once mixed it will set within 5 minutes. Pearls always look stunning and timeless at a wedding. 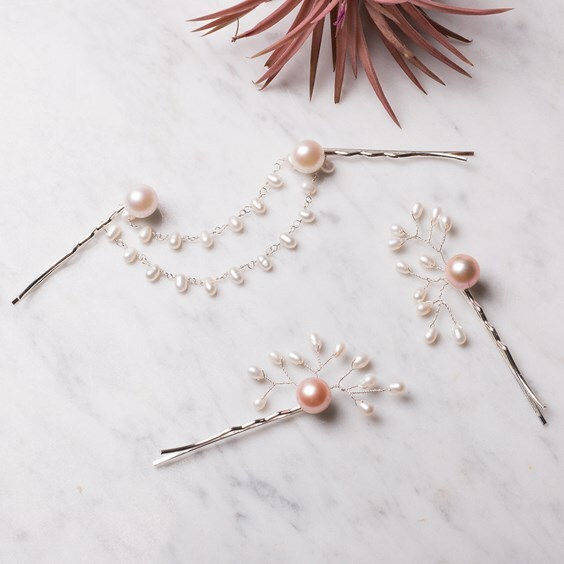 These bridal inspired hair accessories combine blush pink pearls and rice shaped pearls for a modern yet sophisticated look. Perfect for a bride and her bridesmaids! To create the twisted effect, thread a bead into the centre of a piece of wire and twist it to form a twisted effect - repeat with as many beads as you wish and attach together. Secure onto the hair grip by wire wrapping securely. Our organza bags are so beautiful and a great way to present your handmade hair accessories as a gift to someone special. These bags are available in a range of sizes and colours!